It might have turned out differently. In 1979 I led a team whose mandate was to learn how financial institutions lend to micro businesses. The PISCES Project, as it was called, was USAID’s first foray into microfinance, and it would become the spark for greater U.S. involvement in the nascent sector. Funding and personnel from USAID pushed seminal groups like Acción and Opportunity International further into microfinance, while helping initiate its transition from non-profit to for-profit models. Soon, other funding poured in and microfinance became a global development phenomenon. But what if our mandate instead had been to learn how micro-businesses actually financed their businesses? Instead of assuming that institutional credit was what they needed, informal financial management tools including revolving and accumulating savings clubs common in much of the developing world – not merely financial institutions – would have been central to our investigation. And perhaps these tools, rather than formal microcredit, would have captured the imagination of the global development community. While microcredit was rapidly gaining momentum, in 1991, Moira Eknes, then a Norwegian CARE volunteer working in a remote corner of Niger, did what our research failed to do. By studying, the traditional savings clubs prevalent in the villages where she worked, Eknes and her coworkers refined them into a saving and borrowing model called Village Saving and Lending Associations (VSLAs). VSLAs were more flexible and transparent, and more immediately useful for villagers than the traditional alternatives. Eknes never expected that her VSLAs would spread much beyond the small communities where she worked. How wrong she was. Today there are 10.5 million members of savings groups (most of them women) in some 65 countries participating in over half a million groups. The vast majority of these groups are in Africa, but savings group membership is rapidly spreading in Latin America and Asia even in countries where rotating savings and credit associations (ROSCAs) are not common showing the vast unmet need for a safe and convenient place to save and easy access to small loans. Ten and a half million group members are our “proof of concept” but what if we scaled savings group membership to 100 million, or half the current outreach of microfinance? This would translate into savings groups in place in a million villages – that’s equivalent to every village in 66 countries the size of Mali – and in thousands of cities and towns. These groups would collectively mobilize and largely distribute $2.5 billion each year ($1,800 per group) of which $750 million (30 percent) would represent the groups’ profits from lending and fines. Group members, not financial institutions, would reap the benefits. The total price tag spread over a decade would be less than the grant funding to microfinance in a single year ($2.56 billion according to a 2011 CGAP Focus Note). And it could be much less than that. The cost of promoting savings groups is trending downward as the methodology is further simplified, more volunteers are training groups, and some groups are paying for their training. What’s more, group training along with health education is now being delivered on cell phones, and a simple app is being perfected to automate record keeping. I believe promoting savings groups at this scale could become a global development phenomena as profound as microfinance sparked three decades earlier. The difference is that while microfinance struggles to reach the very poor, savings and lending groups are expressly designed to meet their needs. Costs are so low because group members, not institutions, take on the tasks of lending, tracking payments and repayment – the major costs of financial institutions – and no funds external to the groups are required since the money lent is the money the members save. Savings groups prove that the poor are not too poor to save and that there is enough savings potential in a group of 20 to meet most members’ needs, which are as much about insuring there is food on the table and dealing with emergencies as business development.
? Reach those that microfinance is not designed to reach profitably. Even the most motivated micro-lender cannot make money on $0.50 savings deposits and $30 loans.
? Can be promoted by local NGOs. Savings group promoters introduce a simple structure while the groups do the work of saving, lending, collecting and record-keeping.
? Virally self-replicate. The leaders of established groups train new ones at no additional cost. Hugh Allen, a VSLA pioneer and CEO of VSL Associates, found that after four years each group trained by staff had trained two more groups in Uganda.
? Survive independently. A panel study of 331 groups in 6 countries over 5 years indicates a 90% survival rate.
? Serve as a platform for other development inputs. Members launch their own projects – teaching their children to form groups, buying grain when the price is low to better survive the “lean” season and launching collective enterprises. Disciplined groups with financial clout serve as platforms for government and NGO development initiatives and linkages to financial institutions.
? Have documented impact. A Gates Foundation-funded random control trial and anthropological study carried out in 500 villages in Mali showed a decrease in chronic hunger, increased savings, more assets – mainly as livestock that can be easily cashed in – and increased social capital. Crucially, these impacts were village-wide – not just limited to group members. The researchers also found that savings groups sprung up in the control villages in substantial numbers with no staff promotion or training.
? Can promote political change. In Guatemala, savings groups banded together to elect women mayors. In El Salvador, ex-trainers are assuming roles in municipal governments. Eknes told me that women in Niger who were part of the first VSLA initiative are organizing a national structure to make sure they fulfill the gender quota for the coming elections. 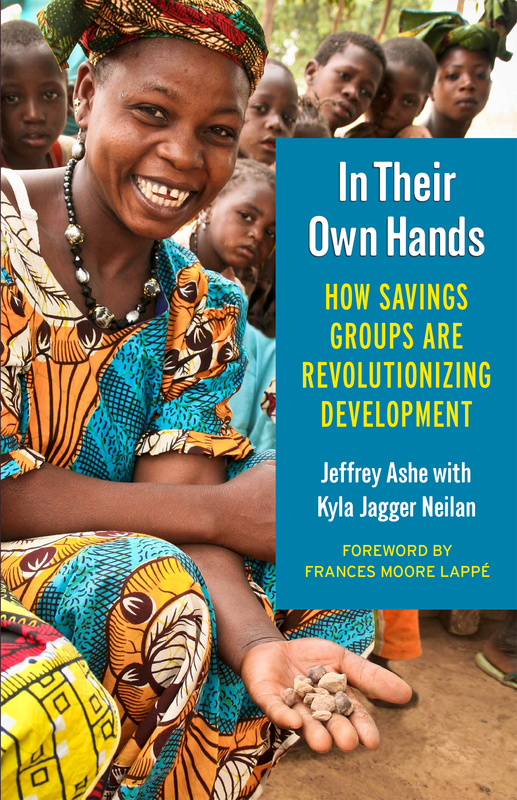 As co-author Kyla Neilan and I write in our recent book “In Their Own Hands: How Savings Groups are Revolutionizing Development,” global development efforts have largely been a failure because they focus on costly staff-intensive interventions that will never serve more than a small percentage of the truly poor – if they work at all. Savings groups can help right that wrong, as the poor undertake the revolutionary act of taking charge of their own future. The strength and transformative potential of savings groups is based on the fact that development tools are in the hands of the poor not an outside agent. Jeffrey Ashe is a fellow at the Carsey School for Public Policy at the University of New Hampshire, Research Fellow, Global Development And Environment Institute, Tufts University. There are two types of savings clubs, ROSCAS (Revolving Savings and Credit Associations) where a fixed amount is paid into a fund each meeting and each member in turn receives a payout of the entire amount collected that meeting and ASCAS (Accumulating Savings and Credit Associations) where members deposit into a common pool and take out loans from that pool as needed. Catholic Relief Services through its Private Sector Provider model trains promoters to train groups as a business. Freedom from Hunger has developed a curriculum for training groups and health education for cell phones. SAVEX panel study of 331 randomly selected groups.